The next version of Laserfiche will allow you to increase the efficiency of the people involved in your business processes by presenting them with detailed instructions and e-mail notifications. One of the new features—called participants—allows you to assign users a role and make them accountable for a specific step in the business process. A participant is the person who completes a specific role in a business process step. For example, a participant named Tom is assigned the role of “Accountant,” and his task is to processes paychecks. Roles are important for two reasons: the role describes the participant’s function (enhancing the details of your reporting) and allows you to configure e-mail notifications that will be sent based on each role. The participant in a role can be a user or group. What does this new feature offer? When a participant opens a Laserfiche entry, details tailored to that person’s role will appear, letting him know exactly what his job entails for that step in the business processes. Note: Information about the business process step is configured in Laserfiche Workflow and can be viewed in the Laserfiche Client and Web Access. Participants can also receive e-mail notification of pending and/or overdue work via the new Workflow Notification System. 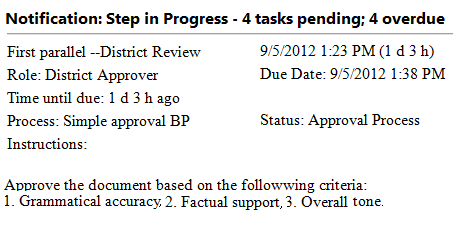 This increases business process efficiency by alerting step participants when they have unresolved tasks. For example, when a business process is waiting, an e-mail notification is sent to the person assigned the task. 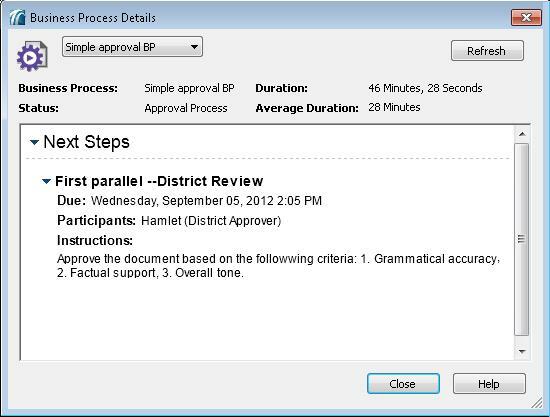 In the Workflow Designer, administrators can view the activity of participants, allowing them to view business process progress and the length of time a participant spent on each step.